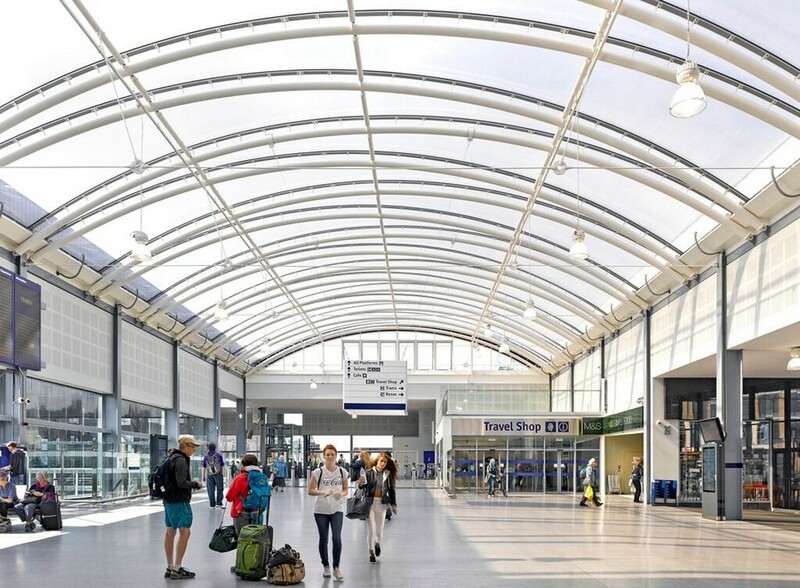 Scotland’s fourth busiest railway station has been crowned the overall winner of the 2015 Saltire Civil Engineering Awards, following completion of a major refurbishment and extension project. Announced annually, the Awards are a much coveted accolade from the Saltire Society and the Institution of Civil Engineers Scotland recognising excellence and innovation in civil engineering. 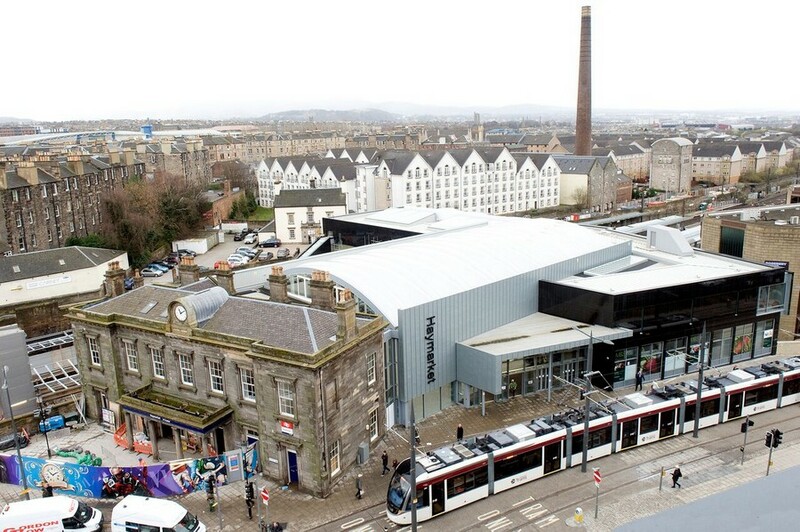 The state of the art transport hub at Haymarket in Edinburgh’s west end has been created to accommodate a predicted 6 million increase in passenger numbers over the next 15 years. The £25 million redevelopment includes the refurbishment of an existing Grade A listed station building and a major extension. The new concourse building, which bridges the platforms and rail lines, was constructed in a former car park adjacent to the station and required two 110 tonne modules to be lifted into place overnight. This innovative solution enabled the completion date to be brought forward by nearly a year, and ensured all work was undertaken while the station was fully operational and without disruption to train services. “The Saltire Civil Engineering Awards represent an opportunity to recognise and celebrate civil engineering at its best across Scotland. I am delighted for the project team behind the delivery of Haymarket Station Capacity Improvement Programme, which was just one element of the Edinburgh Glasgow Improvement Programme funded by the Scottish Government. Other projects to receive commendations this year include the Borders Railway, Ullapool Harbour Improvements, the redevelopment of Hampden Park for the Glasgow 2014 Commonwealth Games and flood alleviation in Inverness. The Awards were presented at a gala event in the National Museum of Scotland on Wednesday 28 October. The Saltire Awards for civil engineering recognise excellence and innovation in civil engineering and are a collaboration between the Saltire Society and the Institution of Civil Engineers (ICE) Scotland. The Saltire Society is a membership organisation, which celebrates the Scottish imagination through support and promotion. It spans all areas of culture and heritage and works to preserve the best in Scottish tradition while encouraging new ideas and developments, helping great things to be imagined and created in Scotland. Founded in 1818, the Institution of Civil Engineers is one of the oldest engineering institutions in the world with a global membership of 80,000. Our 8,000 Scottish members design, build and maintain Scotland’s water, waste, transport energy and flooding infrastructure. ICE is a professional qualification body promoting excellence and innovation in the industry, inspiring the next generation into the profession and providing expert advice to government on infrastructure. 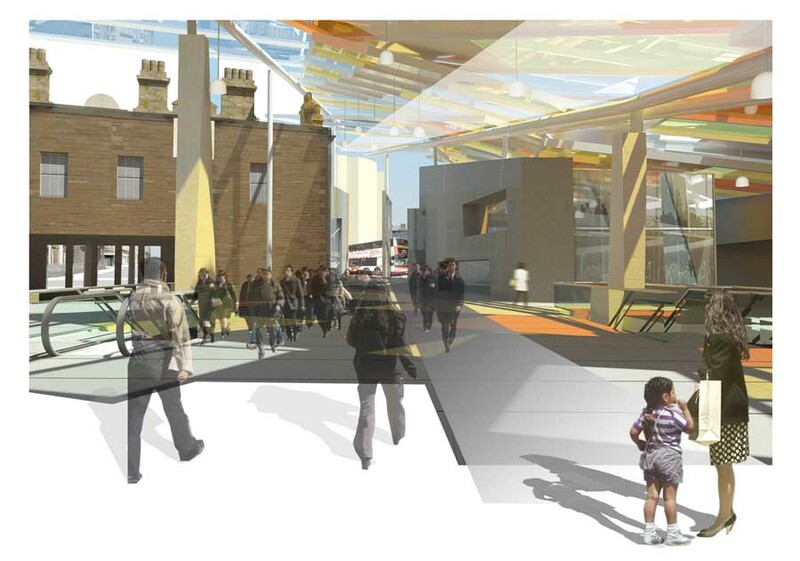 IDP were also the architects for Edinburgh Park Station. 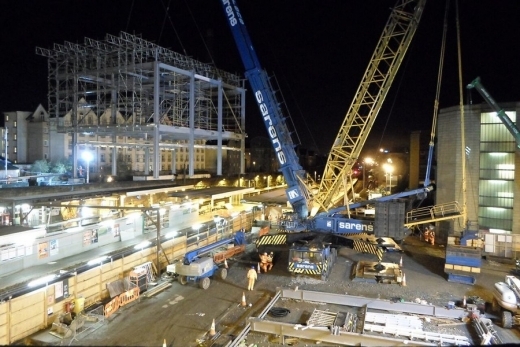 The Haymarket train station will be open to the public from December 19, reports the Edinburgh Evening News. The early Christmas present for passengers comes as the Capital readies itself for a bumper 2014 and the lid being lifted on a number of major projects – a working tram network key among them. 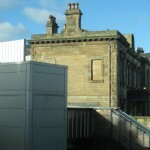 The Haymarket redevelopment is vital to enable the station to handle increasing numbers of patients. Under the new-look concourse floor space has been tripled, while an upper mezzanine with shops and office space has been added. It is believed Marks & Spencer will be opening a convenience store inside the station, similar to the existing outlet at Edinburgh Waverley. 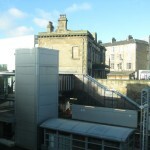 Passengers will enter and exit the station from a new entrance running off Haymarket Terrace for the first time. Network Rail Haymarket project manager Tom McPake, pictured right, said the station would be “genuine value for money”. The overhaul designed to cater for a predicted 125 % increase in passenger numbers over the next 15 years has cost £25m. Edinburgh’s Haymarket station is to undergo a £25m revamp, reporrts the Edinburgh Evening News. 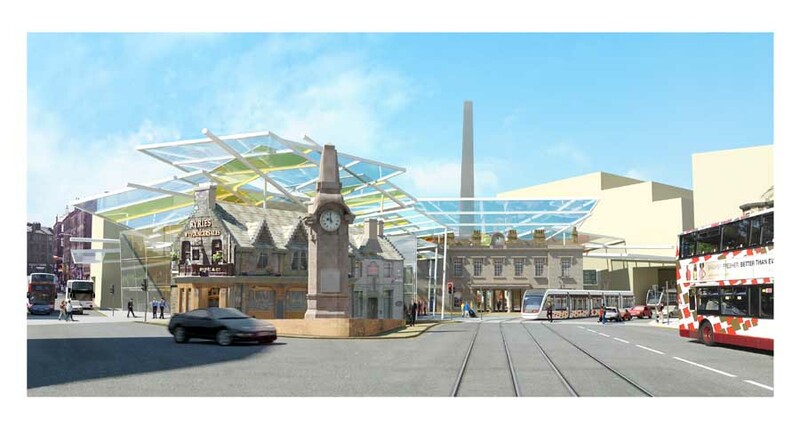 The Haymarket Station redevelopment design is by IDP Architects (based in Glasgow) who previously designed Edinburgh Park Station. Haymarket is to receive the biggest overhaul in its 170- year history, to transform it into a major transport interchange that will be largely complete by late next year. This will provide an important train-tram link from 2014, with the expansion also coping with passenger growth expected to be fuelled by new electric trains two years later – providing more services and cutting Edinburgh to Glasgow journey times from 50 to 35 minutes. The work will get under way next month, at a time when the surrounding area already looks like a building site, with serious traffic disruption caused by tramworks on the surrounding streets. 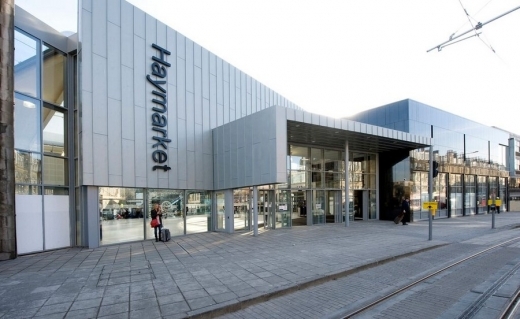 The £25m scheme will refocus Haymarket Station on its original site, behind the imposing main building where the first trains arrived and departed. This has latterly been a car park. 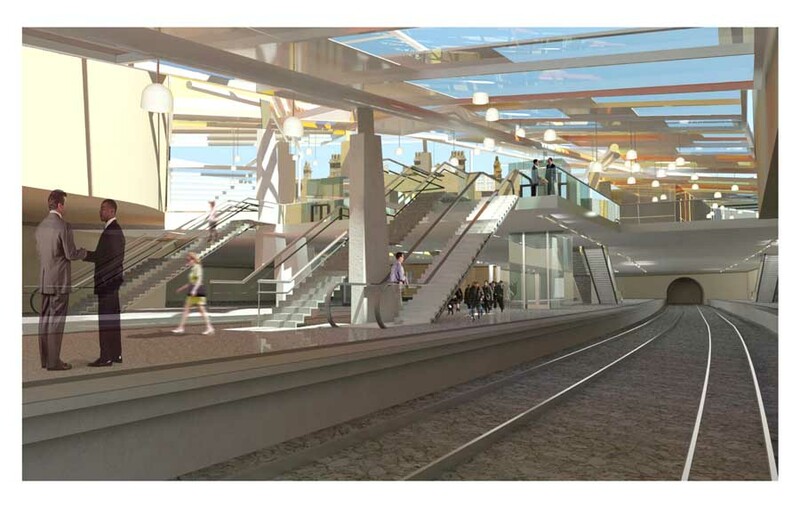 It will feature a large new concourse north of the current platforms, to be linked by escalators and lifts west of the current footbridge and staircases, which will be removed. 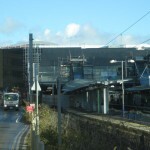 Haymarket Station Redevelopment – external link to IDP Architects site. Aedas’ detailed architectural plans released as part of the Haymarket Interchange Feasibility Study (HIFS) issued this week have provided a vision of the proposed new transport hub at Haymarket train station in Edinburgh, Scotland. 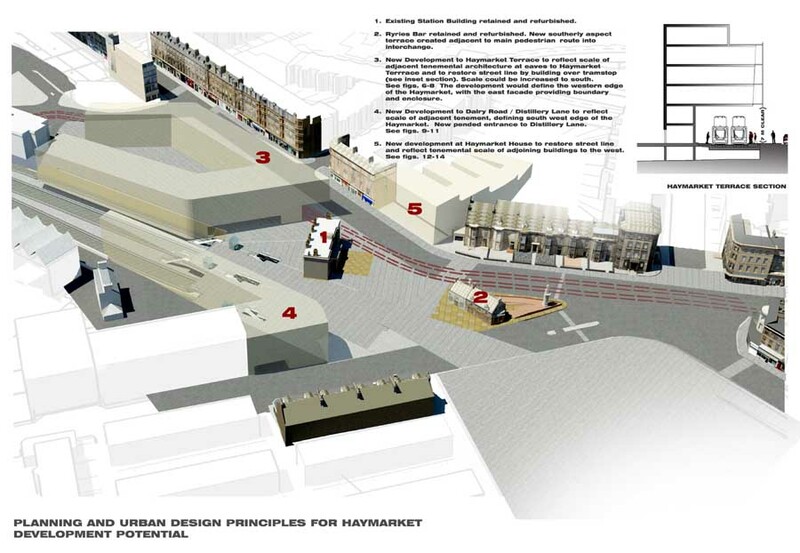 The Haymarket Interchange Feasibility Study (HIFS) was commissioned by the City of Edinburgh Council to investigate how Scotland’s fourth busiest railway station could be transformed into a major and fit-for-purpose gateway into the capital. Detailed designs indicate what the new station could look like, how various transport facilities will fit together, a timeline for construction and estimated costing. The objective of the proposed scheme is to create a vibrant transport hub at Haymarket train station fit to cope with growing passenger numbers. With trams stopping at Haymarket in a few years’ time and increased train journeys scheduled to use it, passenger numbers are set to jump from the current 4m to 9m by 2031 but the station is too small and inadequate to cope with this increase. 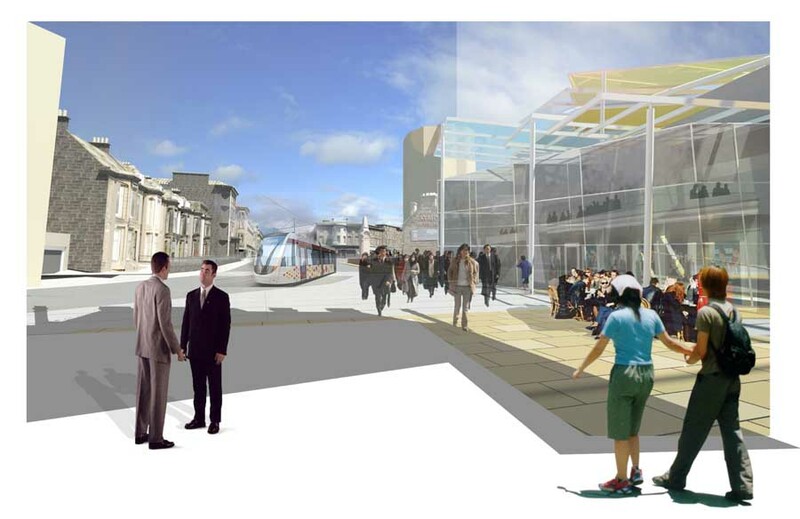 Split into two phases and costing around £190 million in total, Phase One would be publicly funded at a cost of £76.9m. This would involve developing the platform and concourse levels, transport links, road crossings, the glazed roof and the public realm works. Funding for Phase Two, which will involve commercial and retail developments at £113.6m, would be expected to be provided by investors from the private sector. The HIFS will be considered by the Transport, Infrastructure and Environment Committee on May 6th 2008. 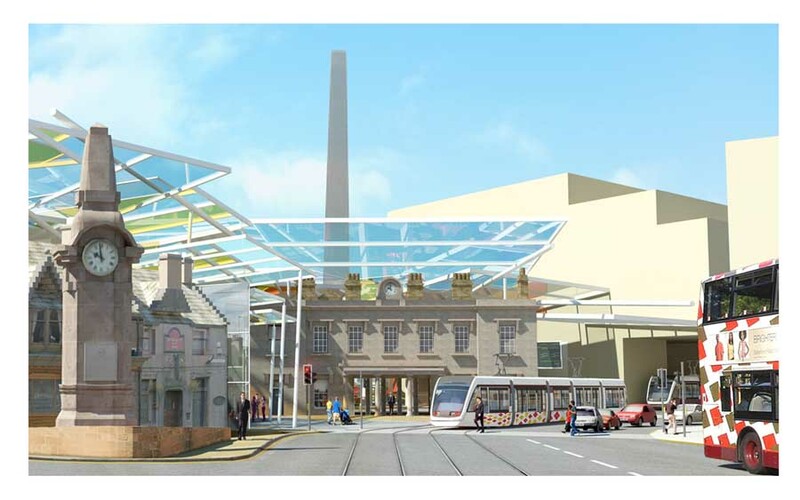 There is no capital funding available for the project yet and if councillors approve it as recommended, Transport Scotland will be approached for funding of the public sector elements – Phase One – of the project. The results will also be passed to Transport Scotland as input to its current Strategic Transport Projects Review, which will consider transport spending priorities from 2012 onwards. Construction is estimated to commence in 2012 once trams are up and running the previous year. Phase One may take two years to complete, and Phase Two could take two and a half years and could involve replacing the existing Roseberry House Office Building. There is an option for both phases to be carried out at the same time, which would minimise disruption to station users. 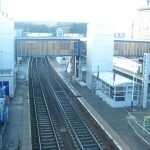 Funded by Transport Scotland, the Council commissioned the HIFS in December 2005 in a bid to examine how the station could be improved. The study was split into five stages and was carried out by Halcrow Group Limited. While the study is being managed by the Council, other agencies involved include Network Rail, First Scotrail and bus operators. During an extensive public consultation as part of the study, 93 per cent of respondents supported refurbishing the station. Out of a shortlist of three options for refurbishment, it was then decided to proceed with option A, which is to retain the station’s listed building and to create a new, purpose-built facility. 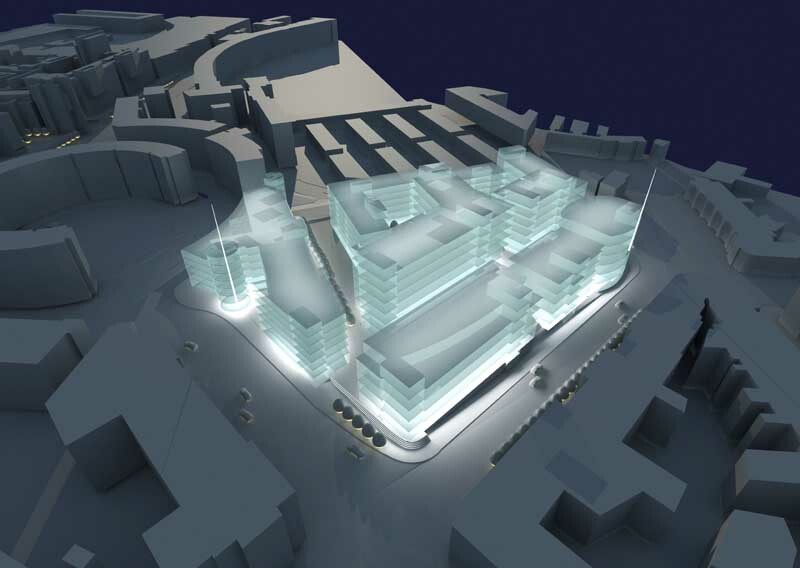 The project is expected to complement other developments which are ongoing in the Haymarket area include the redevelopment of the Morrison Street car park, and the continued growth of the nearby Exchange financial District. Two major projects are expected to have been undertaken before work outlined in the HIFS begins, the Haymarket Accessibility Project and Edinburgh trams. 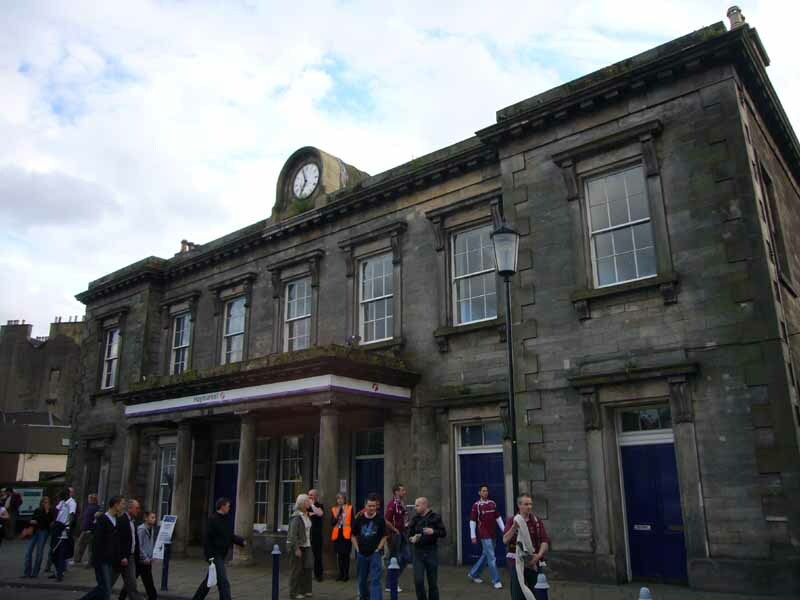 The Haymarket Accessibility Project is being developed by Transport Scotland and First ScotRail to refurbish the station building and to improve access for disabled people and those for whom the current arrangements act as a barrier to using the station. Trams will play an important role in the new Haymarket interchange and the station will feature the city’s major tram-train interchange. The feasibility study proposals will build upon these schemes to provide a long term solution for the growth in passenger numbers predicted over the next 25 years and beyond. Councillor Phil Wheeler, Transport Convener for the Council, said: “A regenerated station is essential to ensure that the city keeps moving effectively as it, as well as the Haymarket area, continues to expand. The existing facility is becoming strained, congested and inadequate, with pedestrians and passengers constantly competing for space. 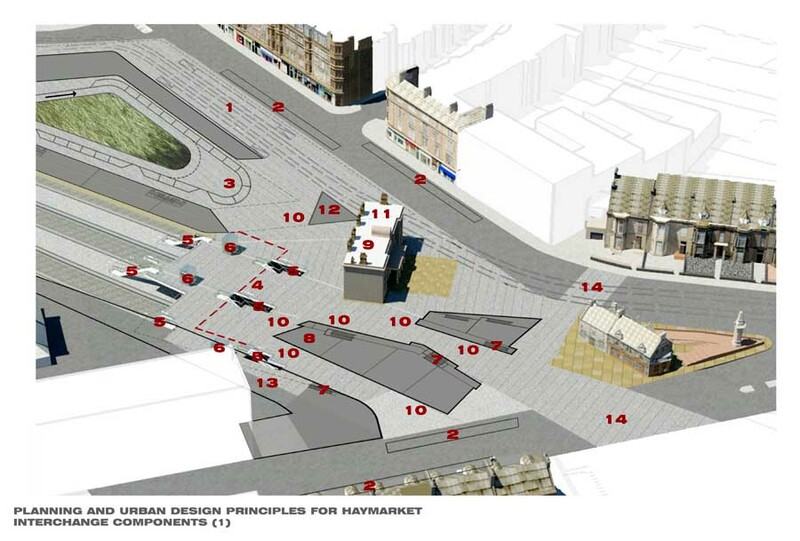 Conclusions from extensive site analysis generated the proposed spatial definition of Haymarket – an uninterrupted public realm from West End to concourse edge. Bounded by buildings of tenemental scale both existing and new, and expanding the station concourse and public realm area from the existing 3,000 square metres to 8,700sqm. Within this defined urban place, the observed desire lines into and out of the interchange are expressed in the form of the roof which arrives, initially constrained between the lines of new development, then bursting dynamically into Haymarket along the multiple lines of flow. Below and around the roof these lines of flow – fast commuter routes and slower places for stopping and waiting – are defined by canopies, structure and both new and existing smaller scale freestanding structures. The existing station building is refurbished for staff accommodation and retained as one of the main entrances into the interchange. The clutter currently occupying the space in front of the building is cleared away to provide an attractive external pedestrian space commensurate in quality with this important listed building. 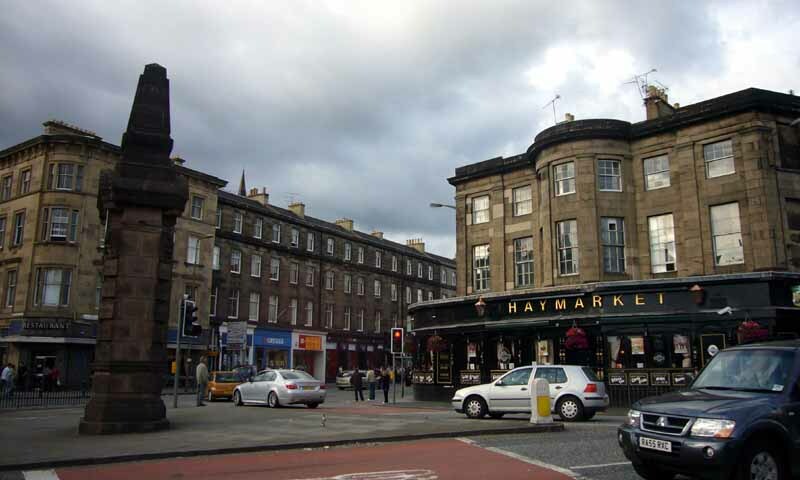 Along with the station building, Ryries pub also contributes to the identity of Haymarket. It will also be retained, with the introduction of a new south facing terrace adjacent to the proposed crossing point at Dalry Road. 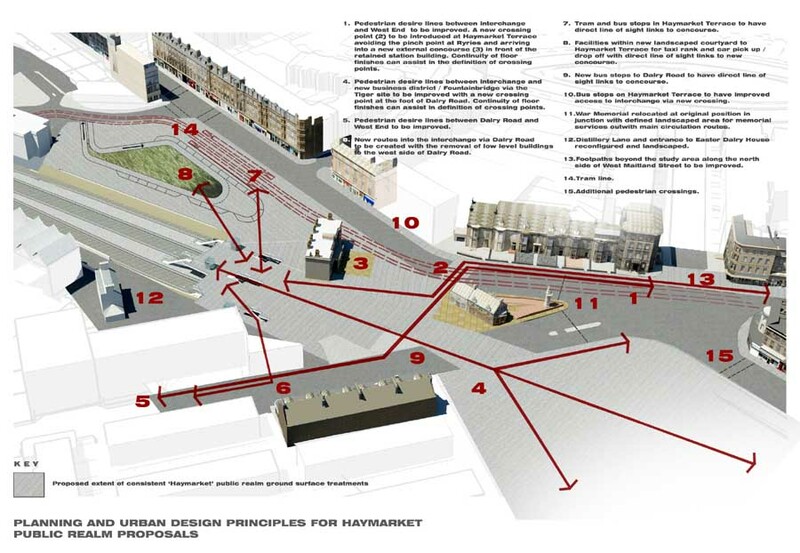 With the main crossing points pushed to the south of Ryries an opportunity is also created to form a new bespoke public space dedicated to the war memorial in its historic position at the heart of the Haymarket junction. 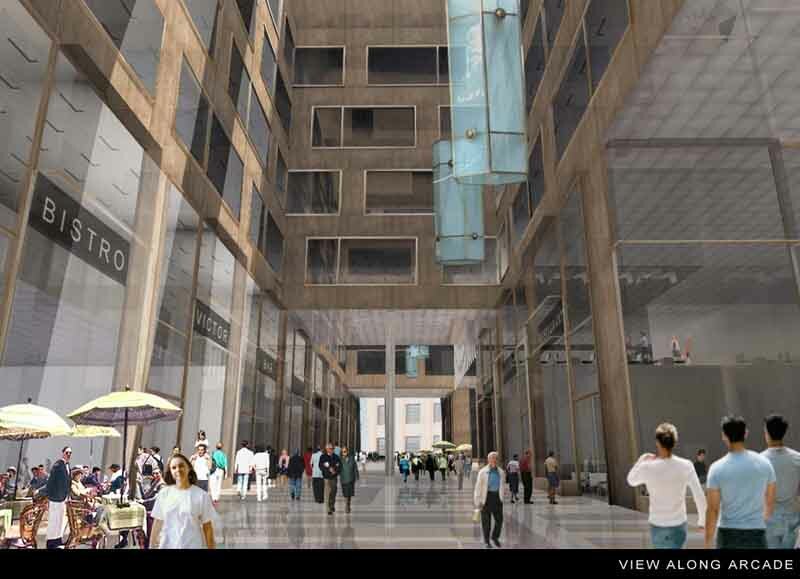 New accommodation below the roof containing retail and leisure functions will define routes through the concourse. In the tradition of Victorian termini, it provides a ‘long life loose fit’ enclosure below which accommodation can change flexibly over time. The lines of primary structure act as wayfinding, leading the passenger up from platform level, through the interchange and out into the city – a memorable arrival sequence appropriate to the status of the new interchange as a significant gateway into Edinburgh. 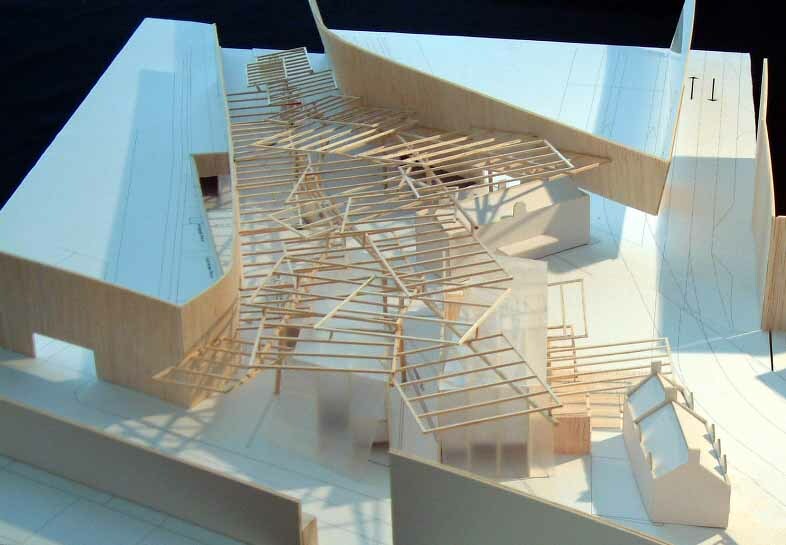 The individual ‘plates’ of the roof respond pragmatically to the multiple geometries which form its perimeter whilst still remaining entirely orthogonal in their own geometry – an economical solution to a complex site. 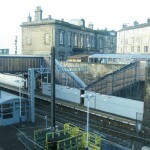 The roof defines the scale of each of the main entrances – re-establishing the axial relationship between the station building and West Maitland Street, terminating vistas along the proposed street through the Tiger site and signalling smaller scale entrances at Dalry Road and Haymarket Terrace. Constructed from lightweight ETFE (thereby reducing the costs of the structure), the roof requires considerably less maintenance than glass and also provides further advantages in both fire and bomb blast performance. The coloured panels of the roof add warmth and dynamism to the interchange during the day as the path of the sun over the building is recorded in the pools of light and shadow moving across the concourse walls and floor. For the rail user, onward connections will be simple and straightforward. 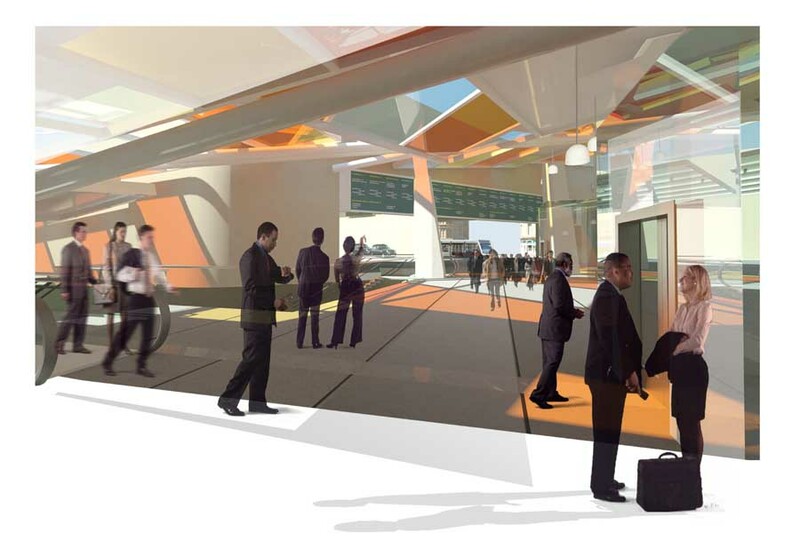 Vertical circulation between platform and concourse is located at mid platform to ease congestion. From the top of the escalator there is direct line of sight to the tramstop, bus stops, taxi ranks, pedestrian routes to West End, pedestrian routes to business district and bicycle storage/hire. Real time customer information signage relating to intermodal connections will further enhance connectivity. 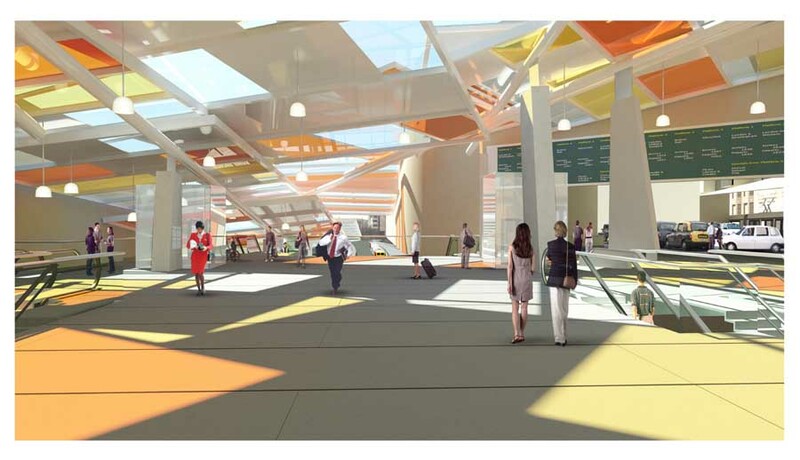 Passengers departing by train will be able to wait at concourse rather than platform level – a significantly improved waiting experience facilitated by both direct visual links down to platform level and good signage. The character created by this visual link is essential in defining the ‘railway-station-ness’ of the interchange and avoiding the often bland shopping mall feel of much current interchange experience. Outwith the main interchange area, opportunities are created for private development at Haymarket Terrace and Distillery Lane. With Haymarket Terrace bounded by the tram lines to the north and railway to the south, a development footprint that occupies the full site area, accessed from a courtyard at its centre, maximises the extent and flexibility of accommodation. 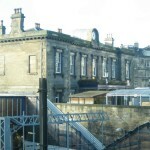 The courtyard should follow the precedent of established Edinburgh gardens such as Rutland Square and will also contain taxi and car pick up and drop off, with basement car parking below. 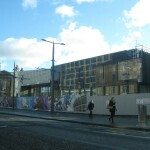 The tenemental scale street frontage to Haymarket Terrace is re-established via a cantilever structure over the tram stop, with the potential for taller development behind. At the foot of Dalry Road, a proper termination of the currently blank tenement gable, wrapping around the corner along Distillery Lane, defines the south west boundary of the Haymarket and provides new accommodation along Distillery Lane accessed off Dalry Road.